RAW trident barrel wooden cigarette holder, double smoking kit. 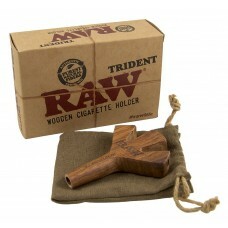 RAW trident wooden tobacco rolling cigarette holder, comes with carry pouch bag. Plus it allows you to smoke 3 cigarette types at once. Most importantly though. The RAW trident cigarette holder is hand made from sustainable brown knot wood. Please note that two holders are may not be same due to the natural colour and growth patterns of the wood. Features RAW trident wooden cigarette holder.